03-Mar-2016 -- Continuing eastward from 46S 168E, I reached this easy Degree Confluence Point which, coincidentally, also lies just inside a patch of forest - a short distance from a road (and separated from the road by farm fields). 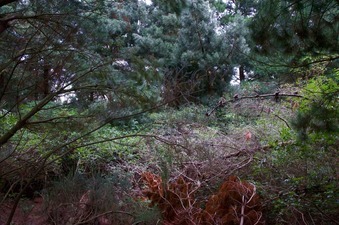 The point lies just 400 m south of the road (East Chatton Road), and just 20 m inside the patch of forest. The farm fields in-between appear to be used mostly for dairy farming (although there weren't any cattle present during my visit). One field, however, was growing a crop that appeared (to my untrained eyes) to be something like spinach.